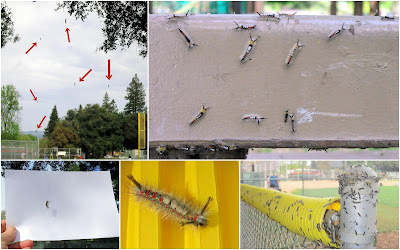 Below: Tussock Moth Caterpillars invade Willow Street Park. They rappel down from the oak trees on invisible silk threads. Fascinating as individuals...in large numbers, not so much. Huh. Brave little bunnies. Or very foolish and naive. Perhaps they took a wrong turn at Albuquerque. I wish them well. As for the caterpillars, that's pretty much an "ugh." We had the motorhome in a state park once in Minnesota when a similar outbreak occurred with their local 'pillars. Hanging from the trees everywhere and going anywhere, on anything, in mass numbers once they reached the ground. Did our best to not kill too many of them by simply getting them off our stuff in order to pack the stuff away so we could leave. Felt like being part of the lamest "nature gone wild" horror movie ever. 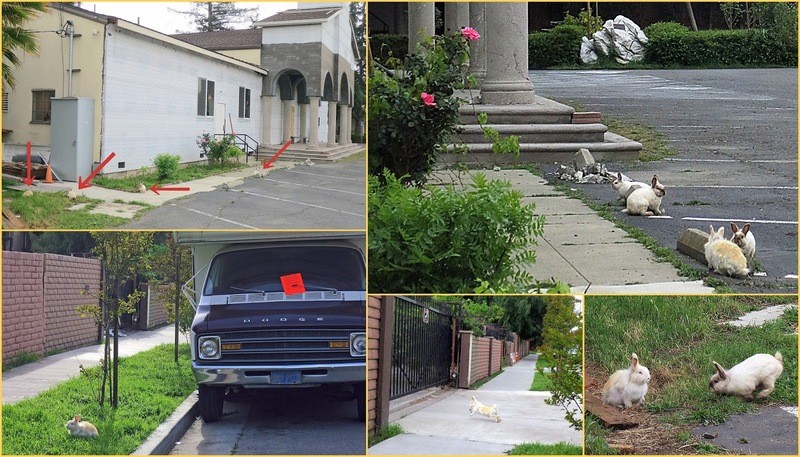 Those bunnies are kind of amazing to me in that they seem to roam freely along a fairly-well traveled street without getting run over. I wonder if they draw any attention from neighborhood cats, seeing as how there's not anything to keep them from getting into the back lot of the church. I've seen a laid-back German Shepard hanging out in the lot (there' a "Beware of dog" sign posed on the gate)--maybe he's their protector. That caterpillar invasion is pretty astonishing...never seen the like in my years of visiting the park. Probably a result of a wet 2017. The only time I've seen comparable numbers of caterpillars is in southern Utah in the spring when tent caterpillar colonies explode in cottonwoods--they don't have tiny silk strands, they just drop to the ground by the hundreds. When I first encountered them there were so many coming down I thought it was raining.